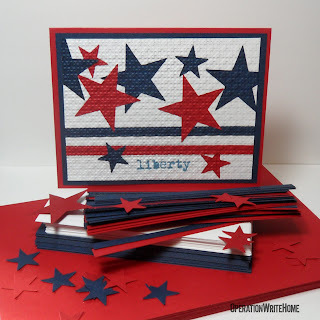 OWH Stars and Stamps (Our OLD blog! ): 4th of July Party: Let the fun continue! We don't have more new challenges today, but you can go back and do more for any of the challenges from the weekend....or leave a comment here with a link to a challenge YOU're putting out for our crafters! We'll be choosing FIVE WINNERS from all entries in all challenges - those winners will get one of our exclusive new OWH embroidered patches! So keep on entering! And all day, our Facebook fans are voting on the best card out of all the samples provided by the bloggers - go vote for your favorite by "liking" it to win a patch too! Consider taking some easy kits to your bbq today - get some cards signed! An OWH patch would look fabulous on my crafting tote. It would be like the crowning jewel!! An epic embellishment!!! The best bling ever!!! Not gonna lie... I am holding my breath and waiting on pins and needles!!! And if I don't win I am placing order #1!!!! I must have a patch!!!!!!!!! :) wooooohoooooooooooo!!! !